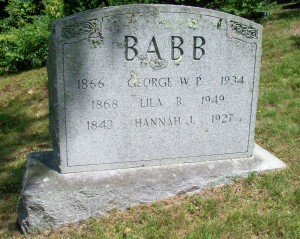 Died: May 13, 1927 in Bourne Ma. at 83 yrs. Married: July 18, 1855 in Cambridge Ma. 1. George William Parsons Babb; (August 18, 1866 – April 15, 1934); Married Lila Bryden (1868 – 1949) (William Robert Bryden & Abigail Caroline Huff) in Boston Ma. on April 2, 1893; George & Lila are buried in Cataumet Cemetery. 2. Edwin A. Babb; (1869 – January 4, 1953); Married Annie W. Baxter (1873 – 1947) (Sturgis C. Baxter & Eva W. Bearse) on January 25, 1900 in Boston Ma. ; Edwin & Annie are buried in Oak Grove Cemetery in Hyannis Ma..
5. Abbie Ford Babb Chabot; (August 10, 1881 – ? ); Married Charles Washington Chabot, Jr. (1880 – 1934) (Charles Washington Chabot & Caroline A. Braser) on June 8, 1910 in Boston Ma..